Liquorice is not just a kind of sweet – there is also a plant called liquorice, Glycyrrhiza glabra. 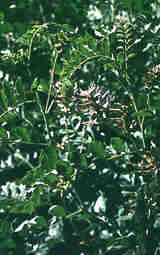 It grows to 1-1.5 metres high and is found, for example, around the Mediterranean. The root at first tastes sweet, but is followed by a bitter after-taste. The sweet taste is due to its content of 2-12% glycyrrhizin, which is a triterpenoid saponin. The evaporated extract from the root is called liquorice and is used for confectionary and as a taste improver in drugs. Glycyrrhizin and many other saponins work as expectorants for coughs since they reduce surface tension. Liquorice is therefore used as a product for treating coughing. Glycyrrhizin is about 50 times sweeter than sucrose – cane sugar. However, if you eat too much of it, you will experience the laxative effect of liquorice, and if you consume large quantities over long periods of time, you will get high blood pressure and heart problems. So when you eat liquorice, it’s not just your teeth you have to worry about. The liquorice plant, from the root of which an extract is refined that is used for making liquorice sweets. 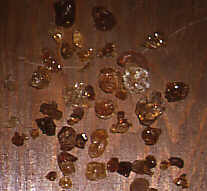 Gum Arabic is a resin from an African tree (Acacia Senegal) used as a texture agent in the confectionary industry. Another plant substance which plays a big part in the confectionary industry is Gummi arabicum or gum Arabic which is the resin from an African tree, an acacia, Acacia Senegal. It is a carbohydrate which is used, among other things, as a thickening agent in many cough sweets.